The Fort Mason Center for Arts & Culture (Fort Mason) is a nonprofit historic center located along San Francisco’s northern waterfront in the Golden Gate National Recreation Area. More than 20 nonprofit and arts organizations are permanent residents of Fort Mason, including the Pulitzer Prize-winning Magic Theatre, the well-established Cowell Theater and the internationally acclaimed Greens Restaurant. Located in the beautifully renovated Pier 2, the San Francisco Art Institute (SFAI) is Fort Mason’s newest tenant. Working in close collaboration with Fort Mason, SFAI reinvented a 67,000-square-foot space on Pier 2 that includes more than 160 art studios for students, faculty and visiting artists, as well as 3,300 square feet of newly created public exhibition space that adjoins the existing Cowell Theater. To celebrate its new Fort Mason Campus, SFAI held a series of grand opening events in November 2017 and commissioned artists to share new works to celebrate the new building over the next year. SFAI alum and faculty Alicia McCarthy (BFA 1994) kicked off this series with a beautiful mural of interwoven color, energy, and gesture—visible throughout the entire space and shown near the top of the accompanying photo from SFAI’s grand opening. Seifel Consulting gratefully acknowledges SFAI, Fort Mason and the LAI Golden Gate Chapter for hosting an event in Fall 2017 to showcase the renovation of Pier 2, which was led by William Leddy and Marsha Maytum, founding Principals at LMS Architects who creatively designed Pier 2’s sustainable renovation. 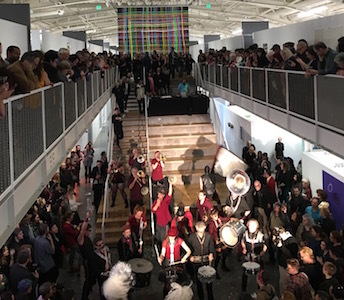 We also had a wonderful time at SFAI’s grand opening celebration meeting the talented array of SFAI students and faculty who exhibited their art works throughout Pier 2.